Peggle happens to be another old puzzle game (a decade old, in fact) that pre-dates the post-Minecraft era indie game boom. 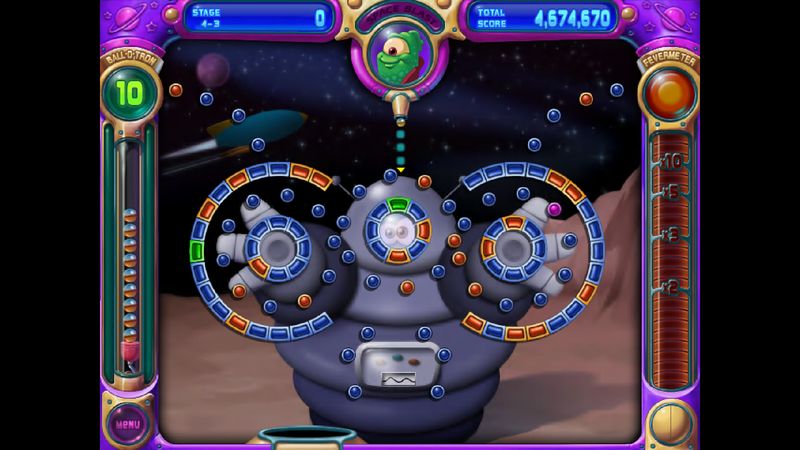 Like World of Goo, Peggle was critically acclaimed on release and despite not initially garnering much in the way of sales, the release of Peggle Extreme (which contained levels based off popular Valve games like Half-Life 2, Team Fortress 2 and Portal) made sales skyrocket and introduced the game to players that would "never be caught dead playing a game with unicorns and rainbows". There's even been a study to suggest that the game improves your mood and fights depression! So, a lot of good things to be said about this game, but what do you actually do in it? Peggle is all about skilled shot planning and bears a passing resemblance to a Japanese game called "Pachinko". The goal of the game is to clear the screen of all orange pegs and you do so by shooting a ball from the top of the screen in such a way that it hits as many orange pegs as it can while it falls to the bottom. Once the ball reaches the bottom you're one ball down unless the ball happens to fall in a bucket that sways from left to right at the bottom of the screen; then you'll have the ball redeemed. You have a limited number of balls to clear the screen of all orange pegs; once you run out of balls, it's game over. On each level there are also green balls that trigger special abilities which help you in various ways such as exploding any orange pegs within a certain radius, giving you an extra ball or even helping you aim. The special ability you gain access to is dependent on which "master" you pick for the level and these guys range from unicorns, aliens, flowers and a French crab that must be a cousin of Sebastian from Disney's "The Little Mermaid". I believe I got this game "On the House" from Origin as I redeemed it for free in 2014 and it's not the sort of title I'm usually that keen on acquiring. So why on Earth did I play it? Because Choona decided to pick another puzzle game as a game to complete as part of "Pile of Shame" Sunday (Why Choona? WHHHHHHYYY???). *Ahem*. Anyway, on to the review. The in-game music is catchy and suits the game. I also like the fact they use a lot of classical music in the game such as Beethoven's "Ode to Joy" whenever you beat a level, Grieg's "Morning Mood" for the intro and even Bach's "Tocatta and Fugue in D Minor" if you pick a certain "Peggle master", although they probably used classical music simply because it's cheap 😉. Also, if you ever get the chance to play Peggle, check out the main menu buttons… there are eight of them and they play all the notes in an octave (I may have tried to play "Do Re Mi" from The Sound of Music but let's keep this a secret between you and me…). 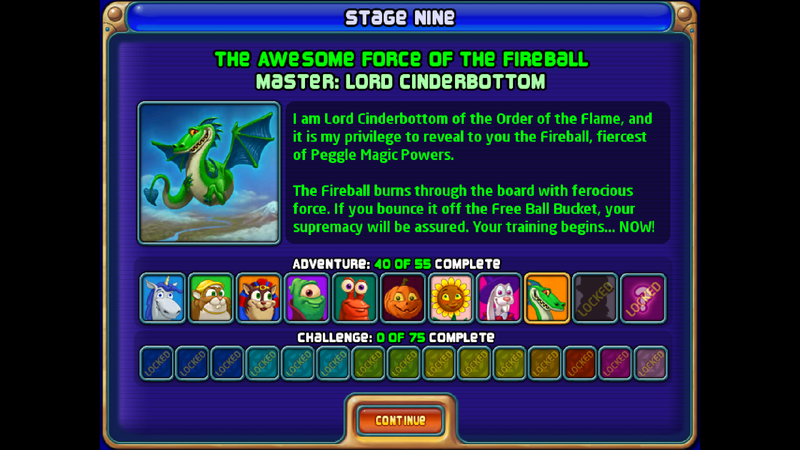 As mentioned earlier, to make the game more interesting, green pegs help to activate special abilities that your chosen "Peggle Master" unlocks. This keeps things fresh plus certain masters are more useful on particular levels. Yes, bright, colourful graphics are what you'd expect from a puzzle game with cute, anthropomorphic creatures and PopCap has done a good job of it. I only really got to try out Adventure mode but if you're up for more of a challenge, there's the aptly named "Challenge mode". You can also play hotseat multiplayer (i.e. taking turns to play Peggle against a friend on the same computer). Peggle is one of those games that are easy to pick up: all you have to do is aim and fire the ball, ensuring you take out some orange pegs on the way; doing this in an effective manner however, takes a little bit of skill (and sometimes luck)! When you've got a game that's easy to learn, has cute, anthropomorphic characters and bright, colourful graphics, you've got a game that's perfect for the family to play. Even a four year old can figure it out. I'm really not good at this game and my wife takes every opportunity to remind me of that. If you're good at pool (which I know from personal experience I'm terrible at) you'd be good at Peggle since it's all about lining up the shots correctly and taking advantage of the angles. If you play pool like me though, i.e. you think smashing balls as hard as possible somehow increases your chances of winning, you might find Peggle a challenge at times. If you like these sorts of games, then this might be a non-issue, but if like me Peggle just isn't your thing, extra modes that are basically more of the same isn't going to appeal. As you can tell, there's not much I can fault with Peggle - the game seems to be perfect for those wanting a bright, colourful, family-friendly Pachinko-style puzzle game that's easy to learn (even simple enough for young kids to pick up). However, Peggle is simply not my type of game especially considering I don't have the patience or skill to be an effective player. The game also lacks any longevity if this isn't the sort of game you're into; it's fun, but it's nothing special. Is the game worth $4.99? : Yes. You'll get at least around 5 hours of entertainment if you play the Adventure Mode all the way through and there are the Challenge and Multiplayer modes to explore too.